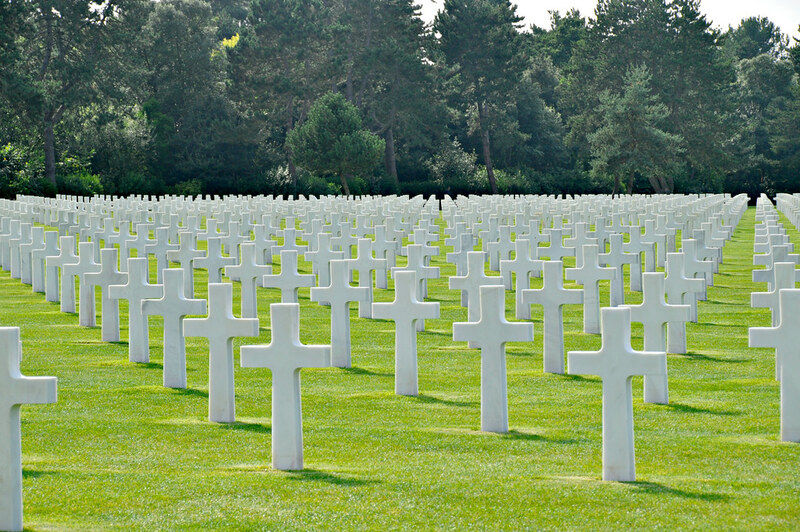 Quando chegámos ao Cemitério da Normandia coincidimos com a visita VIP de um veterano que desembarcou na Omaha Beach no famoso dia D de 6 de Junho de 1944. Foi o melhor da nossa visita vê-lo olhar para a praia e para o cemitério, ele que viveu para contar o horror de esse dia mas que nesse momento o fez com um sorriso como o de quem tem saudades dos lugares onde somos felizes. Ele não foi feliz seguramente, nada neste cemitério traz felicidade mas tantas cruzes serão em vão se não somos capazes de celebrar que a liberdade que temos hojes foi graças á coragem de estes jovens soldados. When we arrived at the Normandy Cemetery we coincided with the VIP visit of a veteran who landed at Omaha Beach on the famous D-day of June 6, 1944. It was the best of our visit to see him look at the beach and the cemetery, he who lived to tell the horror of that day but at that moment did so with a smile like the one who misses the places where we are happy. He was not happy surely, nothing in this cemetery brings happiness but so many crosses will be in vain if we can not celebrate that the freedom we have had was thanks to the courage of these young soldiers. Na nossa Road Trip pela Normandia tínhamos planeado passar por Bayeaux, foi uma visita muito breve tendo como principal objetivo visitar o Museu da Tapeçaria para visitar os 58 painéis que contam a história de Guilherme o Conquistador. Na primeira Guerra Mundial esta foi a primeira cidade a ser libertada pelos ingleses e felizmente ainda mantém o seu charme graças á sua construção á volta do rio Aure. In our Road Trip through Normandy we had planned to go through Bayeaux, it was a very brief visit having as main objective to visit the Museum of the Tapestry to visit the 58 panels that tell the story of Guilherme the Conqueror. 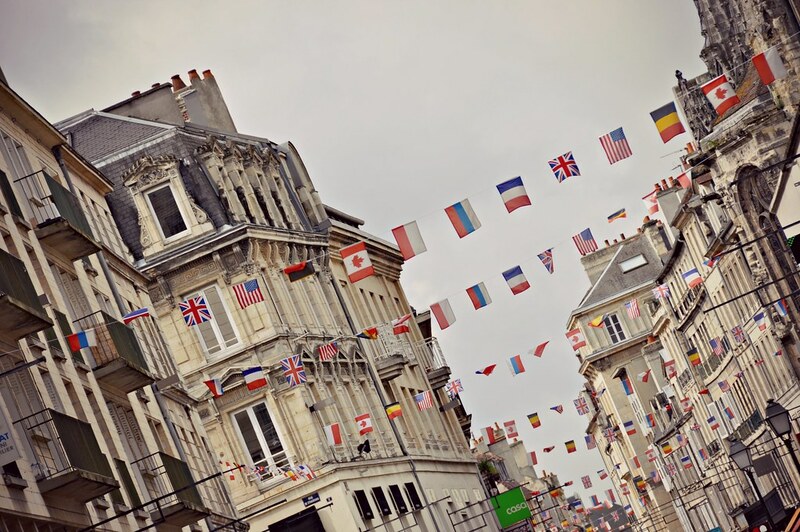 In the first World War this was the first city to be liberated by the English and fortunately still maintains its charm thanks to its construction around the river Aure. Tivémos apenas 24 horas para conhecer Nîmes que apesar de pequena tem vários pontos de interesse e terminámos por não ver todos. Conseguimos no entanto ver os principais onde destacaria a sua Arena romana e a Maison Carrée. Tudo bem conservado de essa maneira tão francesa. 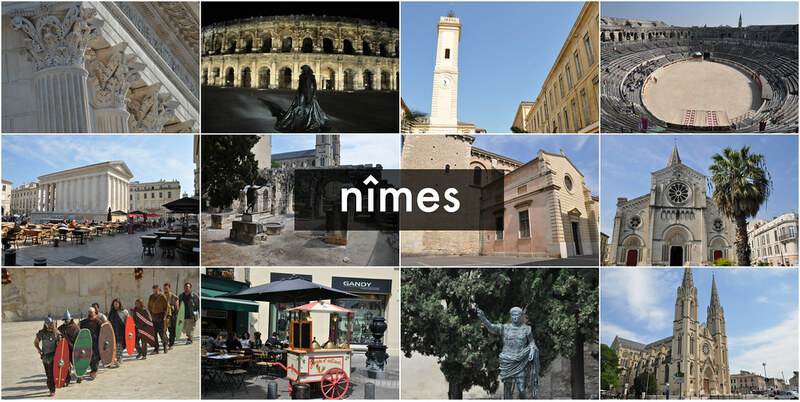 We had only 24 hours to get to know Nîmes which although small has several points of interest and we ended up not seeing them all. We did however see the main ones where you would highlight your Roman Arena and the Maison Carrée. All well preserved in this French way. Sem dúvida o monumento mais relevante da cidade construído no ano de 27 a.C. e que foi restaurando no século XIX para continuar a ser utilizado nos dias de hoje. Quando o visitámos fomos testemunhas de um ensaio dos Grand Jeux Romaines um espectáculo que procura recriar o ambiente original vivido na época do Império Romano. Undoubtedly the most important monument of the city built in the year 27 BC and that was restored in the nineteenth century to continue to be used these days. 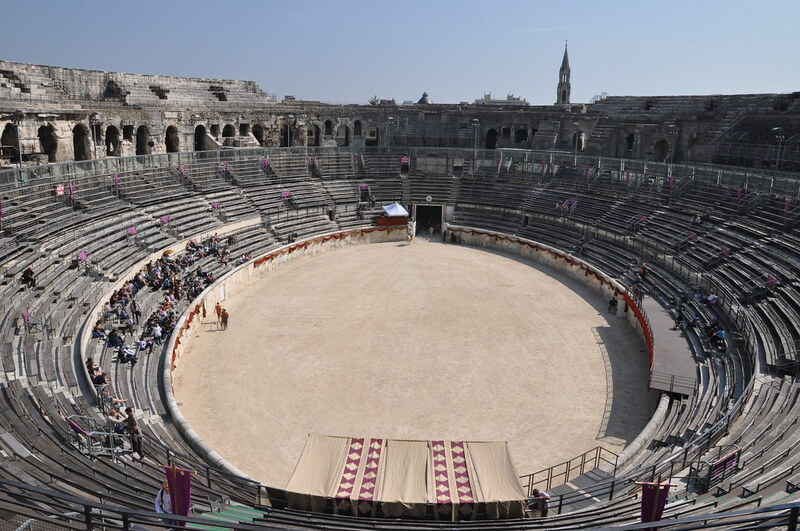 When we visited it we were witnesses of an essay of the Grand Jeux Romaines a show that seeks to recreate the original environment lived in the era of the Roman Empire. Na nossa primeira road trip a França, Avignon era uma das cidades que sabia que tínhamos que visitar, estava muito interessada em conhecer esse grandioso edificio, o Palácio Papal. Não ficámos na cidade muito tempo, o suficiente para ver os seus principais monumentos e para isso contámos com a ajuda do seu comboio turístico que parte da Place du Palais, depois visitámos o Palácio e terminámos passeando pelas suas ruas até voltar para o nosso carro. 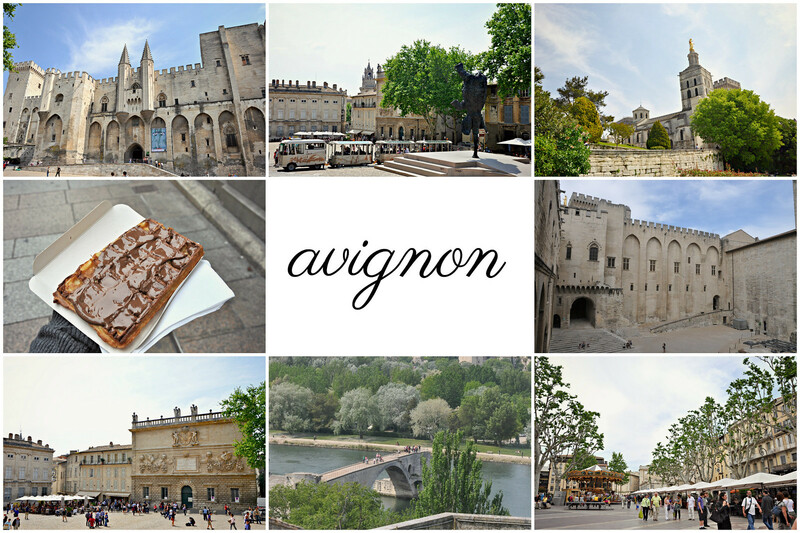 On our first road trip to France, Avignon was one of the towns we knew we had to visit, I was very much interested in seeing that grand building, the Papal Palace. 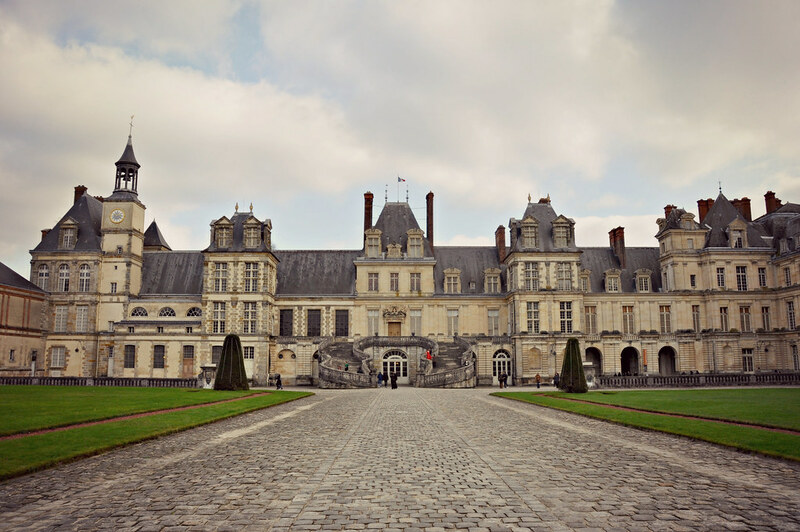 We did not stay in the city long but enough to see its main monuments and we counted on the help of its tourist train from the Place du Palais, then visited the Palace and ended up strolling its streets until we got back to our car. O apartamento que alugámos em Caen ficava a poucos passos da Rue de Saint Pierre, a única que percorremos por completo na cidade, onde tomámos o pequeno-almoço e provámos algumas das delicias que nos chamavam a atenção desde as montras das várias “boulangeries” que encontrámos nesta rua, uma delas tem o prémio da melhor baguete. Pode dizer-se que fica no coração da cidade e começa (ou termina) na praça o mesmo nome. The apartment we rented in Caen was just a few steps away from the Rue de Saint Pierre, the only one we went through completely in the city, where we had breakfast and tasted some of the delicacies that attracted our attention from the windows of the various boulangeries We found on this street, one of them has the best baguette prize. It can be said that it is in the heart of the city and begins (or ends) in the square the same name.